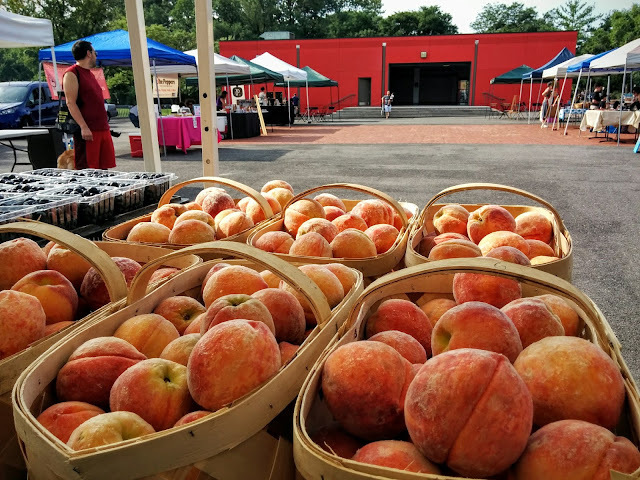 Four Mile Run Farmers and Artisans Market: 4MRMarket Report: Just Another Busy July Day! 4MRMarket Report: Just Another Busy July Day! This week should be a busy one at 4MRMarket with over a dozen vendors and the Alexandria Mobile Transit Store to help you with your commute! The I-395 Express Lanes Project will be conducting outreach at the market as well. Come out early to beat the heat or stick around from 10-12 to listen to the music stylings of Dan Barry! Bagel Uprising is off this weekend and next for a summer vacation, but there are other good breakfast options between Savory N' Sweet, St. Elmo's, and Second Rising! Here is who you will find at 4MRMarket! She Peppers (Alexandria) - Backyard gardeners who have turned the peppers, vegetables, and herbs that we grow into delicious and unique bbq sauces, pepper sauces, hot sauces, dips, and rubs. She Peppers also sells seeds and seedlings of the various types of peppers, tomatoes, and herbs for patrons. Off 7/17 and 7/24--Bagel Uprising (Del Ray) - Are you ready to rebel against dry, stale, flavorless bagels? Look no further! Bagel Uprising offers authentic handmade bagels—boiled and baked in small batches—that will satisfy your craving for the real thing. Bagel sales begin at 10am!! St. Elmo's Coffee Pub (Del Ray) - Brewed Stumptown coffee, tea, apple cider donuts, and always a few extra goodies! Rocklands BBQ Food Truck (Alexandria) - The legendary local BBQ joint is now on wheels! They'll be serving up pulled pork and all the sides and fixins! Kelly Glass Studio (Purcellville, VA) - Kristy Kelly's artisan glass jewelry, homegoods, and accessories from her studio. Bits N' Booties (Alexandria) - hand-knit baby booties, bows, and other great accessories. Cultured Concepts (Alexandria) - Handmade jewelry from Marie-Noelle's shop in Old Town Alexandria, VA that designs and handcrafts a large variety of jewelry pieces. Will be at the market every-other week. Dan Barry is a NY native singer/writer living in the DC area in same vein as Ben Harper, Jack Johnson, or Dave Matthews Band. Remember, the concert is free, but all our performers welcome tips and friendly applause for sharing their craft with you on a lovely Sunday morning. Bring your non-animal-based food scraps in any type of container you choose, or purchase one on-site for a very low fee. Ask for a free coupon book and raffle entry as a thank you (while supplies last)!! BUY. Proceeds of our 4MRMarket T-shirts go to support the expansion and revitalization of 4MR Park. They cost $12 and come in 4 colors. VOLUNTEER. We love help with set-up and tear-down and/or processing SNAP/EBT and Credit / Debit Card sales. Just find a Market Manager to ask to help, or email us at 4MRMarket@arlandria.org for more info. FOLLOW. Keep up to date on all the goings on by following 4MRMarket on Facebook, Twitter, Google+, Email or via our website and blog. SPREAD THE WORD. Please tell folks about us. And tell folks about some of the great things we're doing. For instance, all SNAP/EBT participants can take advantage of the Inova-sponsored "Double Dollar" program again this year that doubles the first $10 SNAP participants spend at the market. 4MRMarket is the first farmers’ market in Northern Virginia to accept SNAP.